Enjoy salty and sweet in one bite. 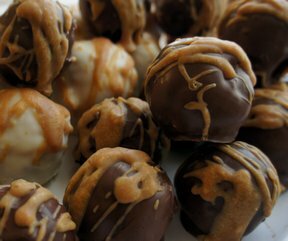 In a food processor, combine walnuts, peanut butter pieces, and milk chocolate pieces. Cover and process until mixture is coarsely chopped. If a food processor is not available, coarsely chop ingredients separately with a knife, then combine. In a small heavy saucepan, combine brown sugar, corn syrup, and butter. Bring to boiling over medium heat, stirring constantly. Stir in sweetened condensed milk. Return to boiling over medium heat, stirring constantly. Reduce heat to medium-low. Clip a candy thermometer to the side of the pan. Continue cooking, stirring constantly, until mixture reaches 236Âº F (approximately 10 minutes). Adjust heat as necessary to maintain a steady boil. Remove saucepan from heat, stir in vanilla. Cool 15 to 30 minutes or until slightly thickened. The mixture is easier to work with when it has completely cooled. 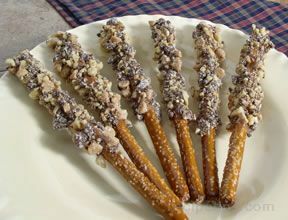 Dip each pretzel into caramel mixture, covering about 2/3 of the rod. Let caramel drip off slightly. 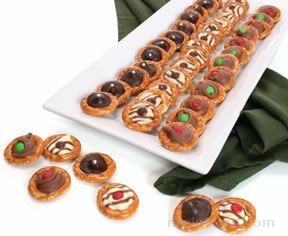 Spoon or roll some of the chopped mixture onto the caramel on the pretzel, pressing crumbs lightly with the back of spoon or your fingers. Let stand on nonstick foil until caramel is set. Store in an airtight container between layers of wax paper in the refrigerator up to 4 days or freeze up to 1 month. Makes 25 pretzel rods or 13 whole Bavarian pretzels. "These were wonderful. 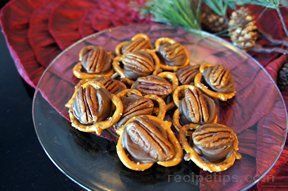 My mom made them for Thanksgiving, what a delicious treat!"